Club Fitness – The P.I.T. Join us for fun-filled days of crafts, sports, field trips and fun! 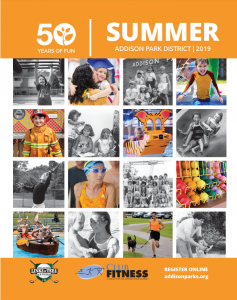 Bring a friend and enjoy your spring break with the Addison Park District. Please bring a sack lunch and a drink every day of camp. Daily field trips will be taken so please arrive no later than 9:00 a.m. Special weekly and daily rates are available. Registration deadline is March 23. Age: Kindergarten - 5th grade Time: 7:00 a.m. - 6:15 p.m.
© 2017 Addison Park District. All rights reserved.